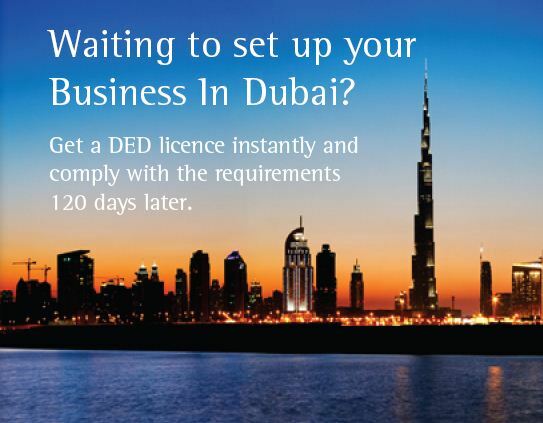 WAITING TO SET UP YOUR BUSINESS IN DUBAI? Get a DED licence instantly and comply with the requirements 120 days later. Setting up a company in Dubai (on-shore) has often been considered to be a daunting prospect due to the different approvals required from various government authorities. This has unfortunately, in some cases, discouraged international entrepreneurs from ‘taking the plunge’. The Dubai Government Department of Economic Development (DED), which is responsible for licensing these entities, has recognised these hurdles and introduced some positive changes to the procedures forsetting up a business in Dubai. The DED can instantly issue a 120-day business license to companies whose activities can be categorised as ‘no risk’ or ‘low risk’. Mr. Mohamed Shael Al Saadi, the CEO of the Business Registration and Licensing section of the DED has announced, that there are 700-800 activities which can be considered as low risk or no risk and in such cases the license to do business can be granted almost immediately. Generally, low risk or no risk activities will be ones which are do not principally or directly affect human beings, animals, plants or the environment. This new scheme, is part of the Dubai Smart Government initiative launched by His Highness Sheikh Mohammed bin Rashid Al Maktoum, Vice-President and Prime Minister of the UAE and Ruler of Dubai. Under the new scheme, DED will issue investors their licenses immediately and will allow them 120 days to complete the usual licensing related paperwork and to comply with the external approval requirements. The main advantage of this initiative is that this licence will enable the investor to get started officially- : including hiring employees, opening bank accounts, obtaining electricity and telephone connections etc. Investors will be issued the license immediately on submission of the relevant license application form, Ejari (the tenancy contract can be either in the name of the company or in the name of one of the partners) and the Memorandum of Association/Memorandum of a Civil Works Company and/or a Local Service Agent Agreement (depending on the type of the entity). 120 days - once the license is issued, the investor is required to obtain all the relevant approvals from the government authorities (eg: Dubai Municipality, tourism department, DHA etc.) within a period of 120 days. Procedure - the procedure to obtain this license is similar to that of a normal commercial or professional license - the only difference being the license is issued first and the approvals are taken later. Restrictions or Conditions - this is a normal or full license with no restrictions and permits the investor to carry on his business in a regular way. The only condition attached is that the approvals required for this activity have to be obtained within 120 days. We understand that no new conditions will be imposed once the license has been issued and if at all new requirements are introduced by the various government authorities, these will have to be complied with at the time of licence renewal. Validity - this 120 day license is a normal commercial or professional license issued by the DED and is valid for a period of one or two years (as the case maybe) and not just for 120 days. After 120 days - the investors are required to submit their approvals to the DED and can also expect inspections form officials from the relevant authorities. It is expected that this new smart initiative will be welcomed in Dubai and will not only save time but also reduce the pressure on investors by allowing them to focus more on the business activity of the company. For further information or queries on the above, contact Vasumathy Subhash at vasumathy@jamesberrylaw.ae or Deepa Suresh at deepa@jamesberrylaw.ae.